The recent run of seemingly interminable rains and HF4 tornadoes may have delayed the Annual-Birthday-First-Bug-Collecting-Trip-of-the-Year™, but it could not cancel it. On Thursday this week, for the first time since the same time last week, a strange ball of hot gas appeared in the sky, temperatures tickled the 70°F mark, and the only moisture we encountered was already on the ground. The weatherman said several days ago it would happen, so I put my faith in his word and made plans with my dad to do what I had planned to do last week – officially open the 2011 bug collecting season. It was a marvelous day in which many interesting stories unfolded, one of which I’ve heard (literally) a few times already. One of our stops was Sam A. Baker State Park in southeastern Missouri. My original reason for coming here involved dead wood retrieval (success) and rattlesnakes (failure, though with a consolation prize – more later). As we were walking the trail in the bottomland forest along Big Creek, I noticed all these holes in ground. At first I assumed a group of hikers wielding their fashionable trekking poles had gone before us and left their mark in the muddy, recently flooded soil, but the holes were just too numerous and not all perfectly round. I had just commented to my dad, “What the heck caused all these holes?”, when I saw the culprit – a fully grown periodical cicada nymph crawling on the ground looking for a tree to climb and begin life as one of the noisiest insects on earth. I looked around and saw another one, and another… they were everywhere! Boy, are we gonna be in for it this year! Missouri and several other Midwestern states will be hosting periodical cicada Brood XIX—the Great Southern Brood! All four of the 13-year species (Magicidada tredecassini, M. tredecula, M. tredecim, and M. neotredecim) participate in this brood, the largest of the 13-year broods by geographical extent, and occur in Missouri in variously overlapping ranges. Magicicada tredecim and M. neotredecim are the two most common species in the Ozark Highlands across the southern part of the state, so the nymphs shown here likely represent one or both of those species. I remember well the previous two appearances of brood XIX in Missouri in 1998 and 1985, when beating for buprestids during May and June was an exercise in futility due to every tree branch literally dripping with these bumbling, screeching insects (too bad I never find buprestids dripping from tree branches like this). Those that didn’t land flapping clumsily on the sheet ended up desperately clinging to my head or flying into my face. If swatting at these flying bullets wasn’t maddening enough, the ceaseless, droning, omnipresent cacophony of their singing was almost enough to send me to the local psycho ward begging for admittance. I think I’ll skip trying to use the beating sheet this year. This entry was posted in Cicadellidae, Hemiptera and tagged cicadas, entomology, insects, Missouri, nature, science. Bookmark the permalink. My first bug shoot of the year was at a sunny river bank, trying to photograph Osmia bees. Not great success, but it was sure nice sitting there in the sun after our dreary winter. Good luck for the new bug season! The season’s first outing with net and camera and fun no matter how many (or few) bugs you actually find! We had an emergence of 17 year cicadas in 2008. People swarmed my office asking advice on how to deal with the mass of noisy insects. I told them to go out and enjoy the event while they had a chance, because it won’t last long and it’ll be 17 years before it happens again. I believe most were dissatisfied with my suggestion. Seriously, it is an amazing natural history event, and I was rather excited to find the nymphs emerging en masse from their burrows – something I had never seen before. I have a few of the nymphs in a cage here in my office with hopes of photographing an emergence sequence (though I’m sure many others will do this as well). Great answer – I’ll have to remember that for this year’s inevitable onslaught of questions. That’s awesome. Love cicadas. We hear them here (phew re: spelling) when it’s super hot — they are the icing on the “crazy hot summer day” cake. I very much enjoyed looking at them when I lived in Michigan–they were everywhere in A^2. Oh, and the reason i thought I’d comment: felt the SAME way about that bright yellow thing slowly moving over the sky, lighting the green grass, and giving me previously unheard of energy and cheer levels. What is it?? Freakishly damp and dark spring here, so hallelujah, it’s back! Love the cicadas out west! They seem to be a bit harder to collect than our eastern species – very flighty, and it’s unwise to swing your net wildly amongst the thorny trees in which they often perch. Many of the species I’ve collected here in Missouri I simply gathered their carcasses when their time started winding down. 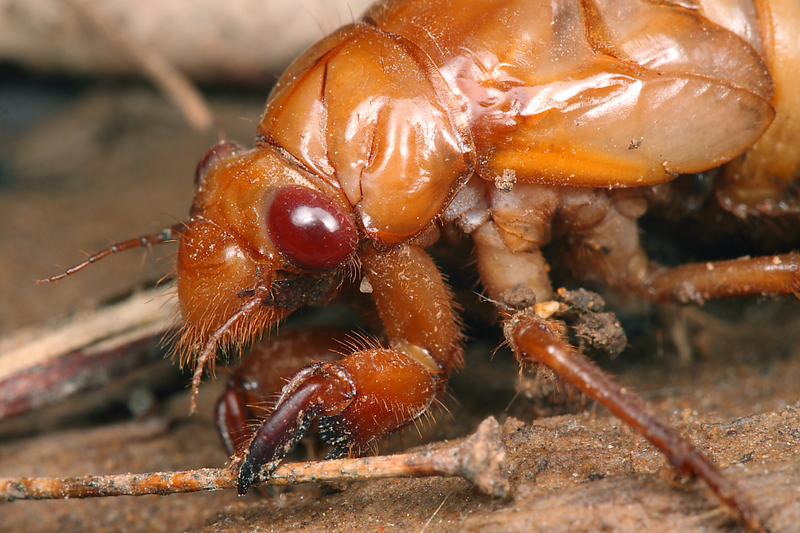 My favorite boyhood cicada memory involves Tibicen dorsata – the giant grassland cicada. Growing up in the more prairie-ish environs of Kansas City, their harsh, machine–gun trill was a familiar sound in the late summer landscape. They’re coming up near the surface in my backyard, too. I reveled in the last emergence (1998) and am remarkably excited about this one, too. Haven’t seen them anywhere around my home – we didn’t live in this house in ’98 so I don’t know how nujerous they are in this neighborhood. Right on time. I just heard a couple singing in Durham, NC yesterday (29 April 2011). During the 1998 emergence, I first found them on 27 April at the same site. That one will likely be easy for you, Ted. Haven’t heard any singing yet – I think Durham is a little further along than St. Louis. Very cool super crop photo – I’m not sure I got it, but I tried! That’s awesome. 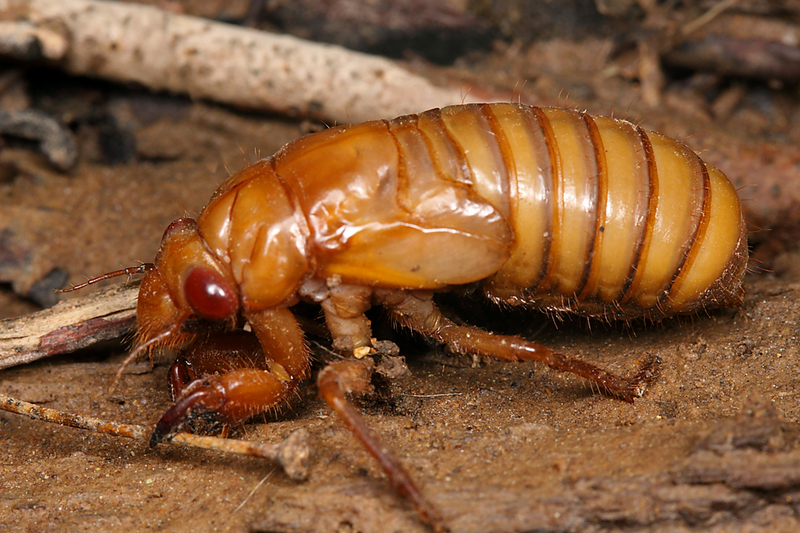 I was planning a trip to the Ozarks at the tail end of May … hopefully there will still be some cicadas hanging about. I don’t recall how late they hang around here, but I suspect there should still be good numbers at the end of the month. I won’t be bothered by my neighbors’ leaf blowers and lawn mowers once these guys get going! I may as well enjoy the spectacle. I hope you don’t mind but your article made its way to our Entomology-Cicadidae group and I’d just thought I’d take this opportunity to introduce myself. I am Gerry Bunker and I run and own the web site Massachusetts Cicadas. For the past several periodical cicada emergences myself and other researchers have been collaborating and compiling data to create new maps of the distribution of all Periodical Cicada Broods including Brood XIX. I invite you to check out Massachusetts Cicadas to find out more on Periodical and Annual cicadas and help with our distribution mapping project and hopefully fill out? I hope it was ok to post this here. Hi Gerry, thanks for commenting and alerting me to your sites. I’ll check them out. Still waiting to hear the first adult, but subsurface nymphs, revealed while planting out in the yard, abound! ….. 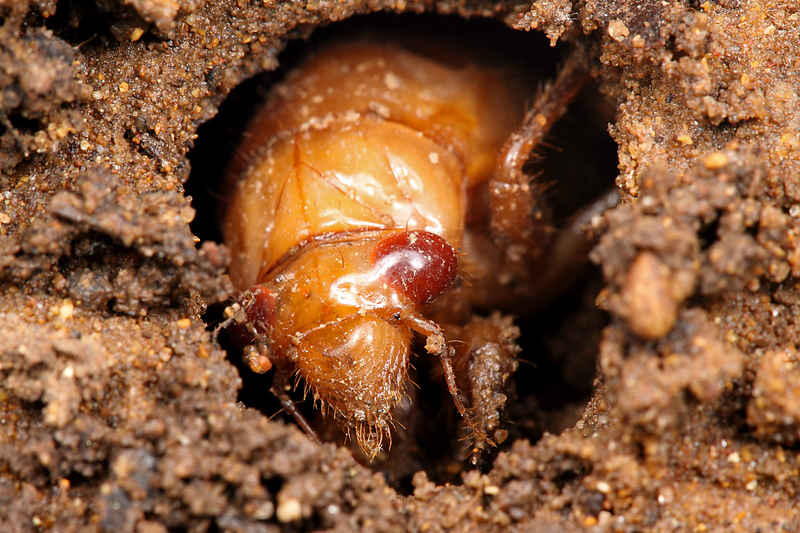 Same here – dug up some nymphs while planting hostas on Mother’s Day, but still haven’t heard any singing yet. Things must be quite noisy by now at Sam Baker! Saw my first shed skins and holes in the dirt a week or so ago. My first nymphs a couple of days ago. Today I counted six nymphs in various stages of molting and four shed skins on the same modest-sized oak trunk. I’ve yet to hear any “singing”, though. Not all those six nymphs on the oak tree made it to adulthood. We’re going to have some very well fed titmice before this emergence is over. The mass emergence down at Sam Baker was 3 weeks ago, and I still haven’t seen anything above ground up here near St. Louis – I expected the air to be filled with noise by now. I have dug up a few, but it seems the cold, wet spring has delayed them quite a bit. Trager watched some cardinals actually digging up the nymphs!